Wolfgang Amadeus Mozart composed and Lorenzo da Ponte wrote the libretto for Don Giovanni in 1787, turning the Don Juan story into an opera that spoke directly to the social order of their own time and into a classic allegory for the ages, entertaining, provocative, and forever puzzling. Don Giovanni, a wealthy aristocrat in 18th century Spain uses his looks, charm, and power in constant pursuit of sexual conquest. The story begins with one gone wrong. He, wearing a mask, is being chased by Donna Anna as he flees from her chambers where he has forced himself upon her; her elderly father comes to her defense and is killed in a sword fight. Over the next day, Giovanni, traveling with his aide and enabler, Leporello, comes upon a previous conquest, Donna Elvira, whom he abandoned and who now pursues him for revenge (but in truth wants him back); then he encounters a young country girl, Zerlina, who he tries to seduce on her wedding day and who initially agrees; and later he comes face to face with a graveyard statue that talks, and whom Don Giovanni invites to dinner. The dinner goes badly, and the Don is escorted to Hell all the while refusing to repent. Whew! Any questions? I still have many. I left the theater entertained and thinking more about what I had seen. The set could serve for a Shakespearean play with shifting courtyard walls and balconies. It’s just me, but I have one complaint – the large mural of amorphous flower petals(?) that covers the rear of the stage was distracting at best and the torn petal in the middle kept grabbing my attention from the players; the shifting color of its lighting did not work for me and seemed to be a lost opportunity for something more creative. I make too much of it; the tale is well told. 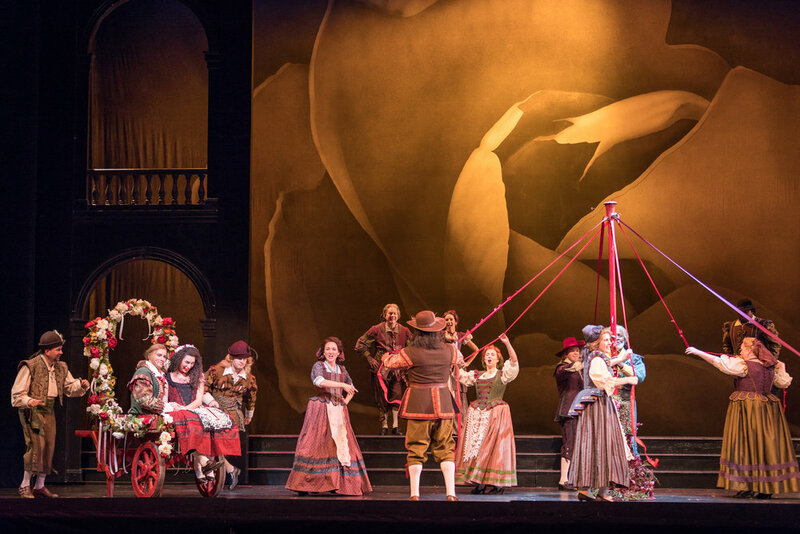 The directorial flourishes we typically see in a Groag production were there: a wedding cart easily shifts our minds to what is occurring in that scene and its overhead rim serves as a frame for several of the singers; as Zerlina reclaims Masseto with her sweet love, they are light-heartedly drawn from the stage; as Donna Anna kneels, singing an aria against the graveyard gates, lighting hitting the gates appear to frame her in angel wings (what did that mean? ); and many more. She also keeps the action moving with smooth transitions between scenes. There was only a minor glitch with the supertitles. Perhaps her finest accomplishment in this Giovanni, and it is major, is that she delivers the humor. Mozart and Da Ponte meant it to be funny in dealing with a serious subject, and on Friday night the audience frequently erupted or tittered with bemused laughter. Conductor Adam Turner led a 38-piece Virginia Opera Orchestra in delivering Mozart’s outstanding score in fine fashion. It is to the credit of the singer/actors on stage that I didn’t give over my focus to this most pleasurable music. A largely young and talented cast of singers bring the characters to life. Baritone Tobias Greenhalgh does an excellent job as Giovanni, bounding from charm to meanness as things went his way or did not. His voice is pleasing, and he sings quite well, but his voice was sometimes too soft and easily over ridden by the orchestra, particularly in singing the faster passages. Overall, his was a very good performance but could benefit from just a little more power and better projection. This contrasted with Zachary Altman who played his sidekick, Leporello; he has a deep baritone with impressive power and projection that he used to what sounded like perfection. His portrayal of Leporello was my favorite performance of the night, perhaps a little too slapstick at times, but ingratiating none the less. The trio of sopranos were also an impressive group. Soprano Rachelle Durkin played the perplexing Donna Anna with gravitas and a strong vocal performance. Her betrothed, Don Ottavio, was played by tenor Stephen Carroll, who sang well but was playing against type – as he appeared on stage, I’d pick him out as the rakish Giovanni in a police lineup, not the passive Ottavio. Mezzo-soprano Sarah Larsen played the contorted Donna Elvira with pain and soft fire, gaining my sympathy with her heartfelt arias. Her mezzo has a lot of vocal color, another standout performance. 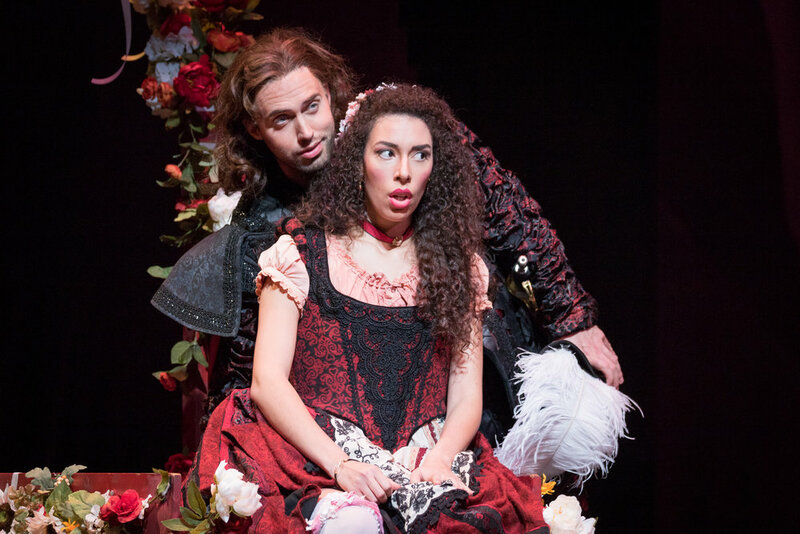 Mezzo-soprano Melissa Bonetti proved to be a delight as Zerlina in a breakout role for her. To me, she managed to sound more soubrette than mezzo and plays Zerlina with coquettish charm. In supporting roles, baritone Evan Bravos is a believable Massetto, Zerlina’s betrothed, and bass Nathan Stark is a powerful, imposing Commendatore, Donna Anna’s father, at least as the graveyard Stone Guest. Director Lillian Groag has stated that this is Mozart’s and Da Ponte’s version of Don Giovanni and yet at the very beginning, she stacks the deck. 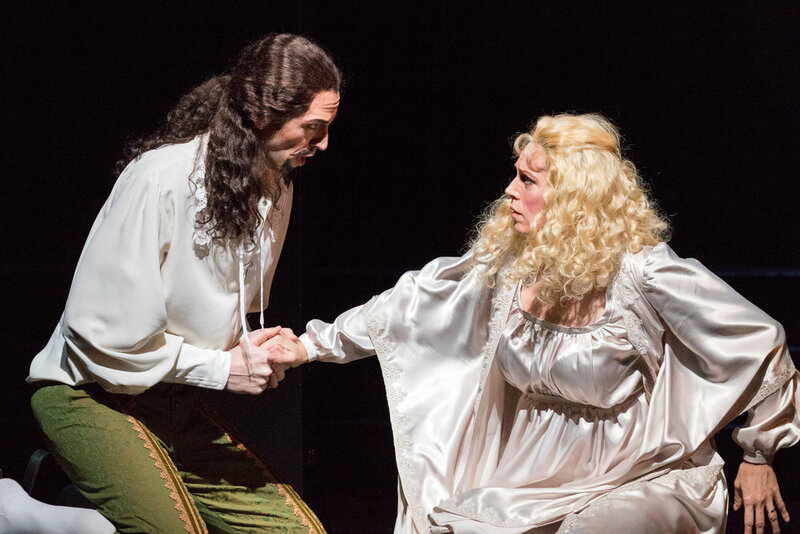 I still believe Donna Anna’s story: she allowed Giovanni into her bed chamber thinking it was her fiancé, Don Ottavio, and he forced himself upon her; realizing her mistake, she fought him off and he fled; she pursued him to keep her unknown assailant from getting away. Director Lillian Groag, however, raises questions. Did Anna really think a masked nobleman entering her chamber late at night would be her earnest, reflective fiancé? Did her reasons for bravely pursuing him to find out his identify perhaps include wanting to know who had fired her passion? Did her reasons for delaying her marriage include a lack of passion in her relationship with her fiancé. Personally, I can accept Donna Anna’s answers to these questions, but then Ms. Groag plants evidence not provided by Mozart or Da Ponte. As the opening overture winds down, Don Giovanni appears, and in darkness a woman comes out onto a balcony and drops a rose to the ground. He picks it up and climbs the trellis, entering the chamber above. Methinks this is also Lillian Groag’s Don Giovanni. 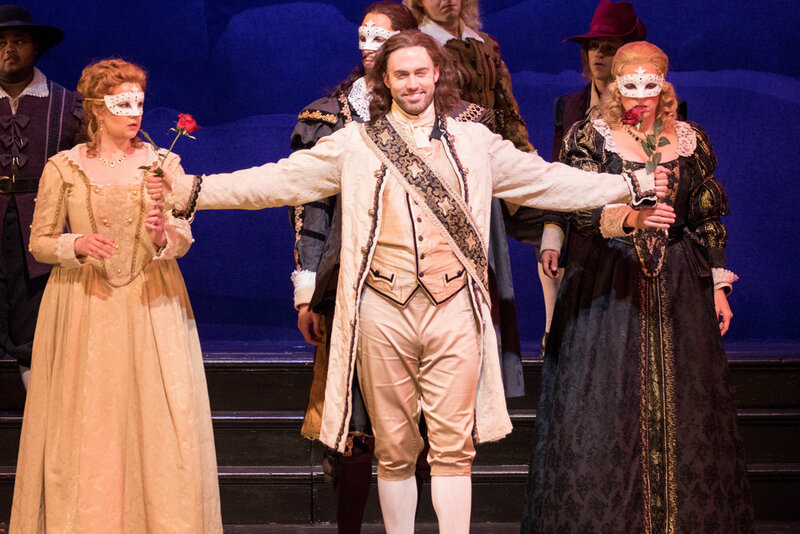 Don Giovanni is a great opera, but it also points to what I feel is missed opportunities in opera today – too little focus on producing operas that show human relationships in today’s terms. Mozart spoke to the social order and customs and mores of his day, a time with with kings and queens and noblemen. The themes are certainly still relevant, but do millennials identify with those times? A young woman seated behind me exclaimed as intermission began, “Those women (referring to Donna Anna, Donna Elvira, and Zerlina). They’re idiots!” Do the young women of today not identify with these three characters? I don’t know and where are today’s operas that might enlighten us? Imagine Don Juan as a star quarterback at a major university today. Joe Namath once bragged about the hundreds of coeds that he bedded while at the University of Alabama and basketball great Wilt Chamberlain put his number in the thousands. Don’t you think such a story would bring millennials to the opera, not just because it is sensational, but because it is more clearly relevant to their lives today? No opera for that? Too sensational maybe? Mozart and Da Ponte had to battle censors. I think it’s unfortunate. Don Giovanni’s message about the disruptive effect of eros on our lives is worthy of exploring in modern terms. I will further contend that only the power of opera can do that theme justice. Virginia Opera’s Don Giovanni - Go see it. Go see it because it is a great opera, maybe the greatest. Go see it because you want to hear some of Mozart’s best music. Go see it because you want to laugh. Go see it because you want to demonstrate how cultured you are. Go see it because you want to get into arguments with your spouse and friends and me. 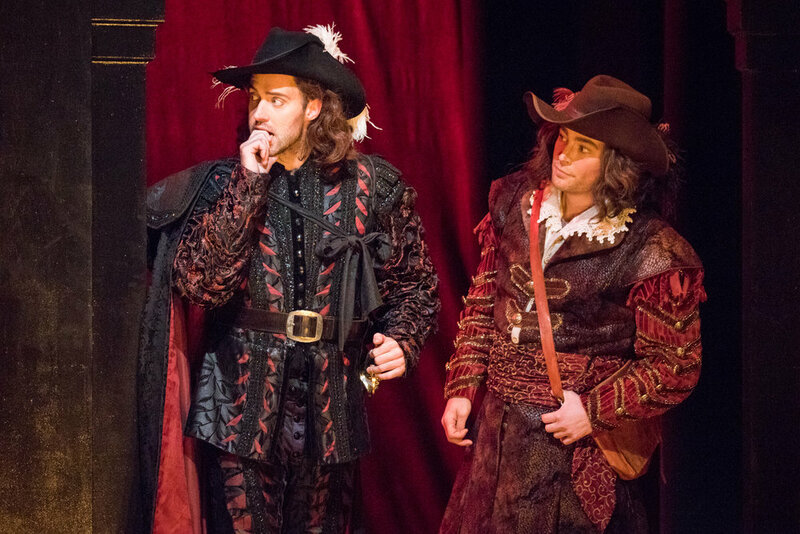 Perhaps, go see it because it is the best telling of the Don Juan story and there is nothing like it out there today! 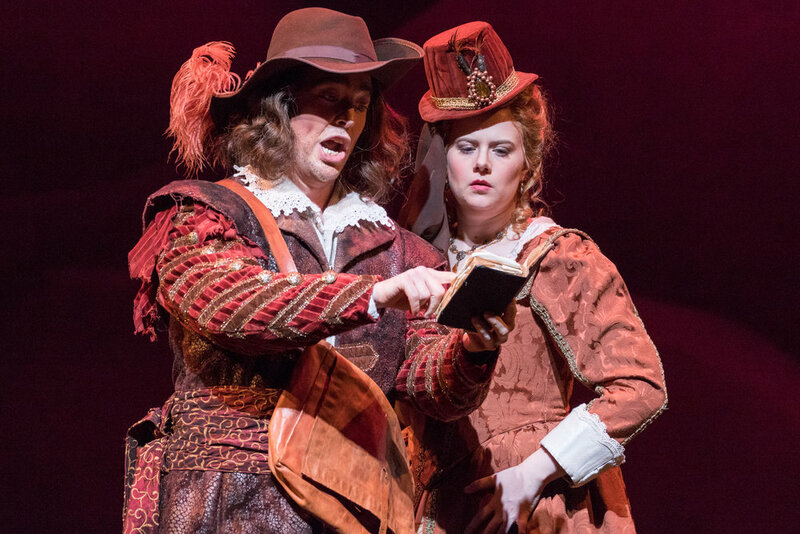 The Fan Experience: Don Giovanni plays once more in Norfolk on November 6, then moves to Fairfax for performances on November 10, 11, before finishing in Richmond on 16, 18. As always the pre-opera talk 45 minutes before the opera by Dr. Glenn Winters, VA Opera’s Community Outreach and Musical Director, is informative and entertaining; in fact, I have never seen him so passionate as he was about Don Giovanni. Also check out his blog reports on Don Giovanni. And as always it was standing room only; get there early. The Harrison Opera House in Norfolk. Photo by Ben Schill Photography; courtesy of the Virginia Opera. My visit to the Harrison Opera House allowed me to complete the Virginia Opera hat trick. I have seen performances in the George Mason University’s Center for the Arts at Fairfax, the Dominion Arts Center in Richmond, and the Harrison Opera House in Norfolk. Maybe some time I will compare them in a blog post. I will say that I liked the Harrison as a moderate size opera house with modern décor, ample parking, and easy in/easy out. I also hope to go back when I can spend some time exploring Norfolk and environs.